More than a thousand Scientologists and guests gather on Saturday, October 14, to commemorate the historic opening of Ireland’s first Church of Scientology and Community Centre, in the heart of South Dublin. 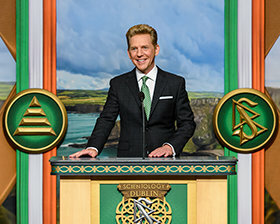 Mr. Miscavige’s presence in Ireland’s capital city marks the significance of the day, as he dedicates Dublin’s new Church of Scientology and Community Centre. Throughout the dedication address, joyful cheers and applause ring out in recognition of a red-letter day in Dublin. In front of the expansive crowd gathered in anticipation, Mr. Miscavige leads the dedication. The Church of Scientology Ireland is dedicated October 14, 2017, before a spirited audience on hand to welcome the Church to its spectacular new home. Scientologists and their guests assemble in South Dublin, to witness the festive ribbon cutting on Saturday, October 14. The celebration continues inside the auditorium, driven so effortlessly forward by the first lilt of Irish instruments, fiddle and flute, and the thunderous staccato of Irish step dancers. The grand opening ceremony celebrates the revitalization of a central hub for local activities and events for the strengthening of communities across Dublin and all of Ireland. Mr. David Miscavige with (left to right): Ms. Nicola Keating, Tallaght Anti-Drug Activist; Ms. Amina Moustafa Keogh, Sports Against Racism Programme Director; and Mr. Philip Cummings, Award-Winning Poet and Translator. Once the ribbon falls, the crowd pours through the doors, getting a first, inspiring look at the new Church and Community Centre for Dublin. Scientologists and guests from the community gather in the new Centre’s Caifé Na Dothra. A HOME FOR THE COMMUNITYThe new Church of Scientology and Community Centre proudly welcomes those who share the goal of bettering the lives of individuals and strengthening communities across Dublin and throughout Ireland. RECEPTIONOpen seven days a week, morning to night, the Church of Scientology and Community Centre of Dublin Reception welcomes anyone wishing to obtain an introduction to Dianetics and Scientology. SCIENTOLOGY PUBLIC INFORMATION CENTREThe Public Information Centre offers some 500 films, providing a complete introduction to every aspect of Dianetics and Scientology. These films are available in 20 languages, including Irish, and present the beliefs and practices of the religion, a biographical presentation on the life and legacy of Founder, L. Ron Hubbard, as well as the many humanitarian initiatives and community outreach programmes the Church supports. CAIFÉ NA DOTHRAWhile touring, or attending one of the many community events, visitors can enjoy the indoor-outdoor Café for a tea, an espresso, a snack or a full dinner. THE SPORTS PITCHThe multi–purpose, fully equipped pitch accommodates Gaelic football, hurling, rugby and football. It is open for use by local clubs, schools and youth organisations. THE AUDITORIUMThe Centre’s Auditorium seats more than 1,000 and features a grand piano, state-of-the-art audiovisual equipment and superior acoustics. This community meeting ground is available for charity events, concerts, literary nights, neighbourhood gatherings, educational seminars, conferences and civic functions. THE CHAPELThe Chapel provides for Church congregational ceremonies and services—including Sunday Services, Weddings and Naming Ceremonies. This Chapel is also where groups of all denominations can assemble for a variety of events, including seminars and conventions. INTRODUCTORY SERVICESThe Church of Scientology Dublin provides for the delivery of all Introductory Services. These include evening and weekend Dianetics and Scientology seminars, imparting an overview of fundamental principles and their application in life. Among the many services available is an entire array of Scientology Life Improvement Courses to help better any aspect of one’s life. DIANETICS & SCIENTOLOGY BOOKSTOREThe Church of Scientology and Community Centre of Dublin Bookstore makes available L. Ron Hubbard’s works on Dianetics and Scientology. In all, Mr. Hubbard’s legacy comprises tens of millions of published words in dozens of books and thousands of recorded lectures. THE PURIFICATION CENTREL. Ron Hubbard developed the Purification Programme to help free individuals from the mental and spiritual damage caused by drugs and environmental toxins, through a regimen of exercise, sauna and nutrition—all of which are provided in our Purification Centre. The mural pays homage to the eternal strength of the Irish spirit. Each of Dublin’s auditing rooms is ideally appointed to provide the calm, distraction-free setting requisite to achieving spiritual enlightenment. THE ACADEMYThe Academy is where Scientologists train to become auditors—spiritual counsellors—capable of helping others attain spiritual freedom. The Dublin Academy comprises multiple course rooms, each devoted to a different aspect of training. THE OFFICE OF L. RON HUBBARDAs is traditional in all Scientology organisations, the Office of L. Ron Hubbard stands in honour of our Founder and symbolises that this Organisation is true to his writings and ideals. NATIONAL AFFAIRS OFFICE FOR IRELAND The Church of Scientology National Affairs Office is located within the iconic Merrion Square and offers Scientology-sponsored programs across all of Ireland. NATIONAL AFFAIRS OFFICE FOR IRELAND The historic facility in Dublin, opened October 15, 2016, is committed to the unqualified delivery of Scientology-supported programmes on the Emerald Isle. NATIONAL AFFAIRS OFFICE FOR IRELAND Over the past 12 months National Office staff with campaign volunteers have reached hundreds of thousands of students, teachers and everyday citizens with civic initiatives. Chief among those is a campaign to spread the Truth About Drugs to nearly half a million people. NATIONAL AFFAIRS OFFICE FOR IRELAND United for Human Rights has carried out an unending campaign of seminars, lectures and marches to drum up awareness and spread support of the Universal Declaration of Human Rights. NATIONAL AFFAIRS OFFICE FOR IRELAND The Church of Scientology’s National Affairs Office was meticulously restored under historic preservation standards and stands as the headquarters for the Church’s social betterment programs in Ireland. A new Church of Scientology and Community Centre on a multi-acre estate opens its doors to the communities of Dublin. Ireland has long been a land of vistas that evoke ancient beauty and eternal stories that, retold again and again, are said to keep the Earth spinning on its axis. That tradition cuts through today’s world with beauty, passion and pride that make the Emerald Isle a place forever calling one’s return. So it was, on a rich October afternoon, 12 months to the day since inaugurating a National Office in Dublin’s iconic Merrion Square, the Church of Scientology cut the ribbon on a new Church and Community Centre. The facility is dedicated to offering Scientology-sponsored programmes and providing a central hub for local activities and events for the strengthening of communities across Dublin and all of Ireland. The gifts of that knowledge, Mr. Miscavige noted, were given to the world with a graciousness that is reflected in the spirit of cooperation and community service that the new Centre represents. Indeed, the city holds a special place in the history of Scientology for, in 1956, Scientology Founder L. Ron Hubbard lived in Dublin and worked in Merrion Square, where he developed the Personal Efficiency Course, a programme designed to enable anyone to operate more effectively in life. The National Affairs Office in Merrion Square, opened October 15, 2016, rekindled that tradition and, in turn, offered Scientology-sponsored programmes across all of Ireland. Over the past 12 months the Office has reached hundreds of thousands of students, teachers and everyday citizens with civic initiatives spanning drug prevention, literacy, human rights awareness and youth activities. National Office staff have further served to host University interfaith classes, awards galas celebrating Anti-Drug champions and open house events to promote the Universal Declaration of Human Rights. Carrying forward in that very same spirit, the new Church of Scientology and Community Centre, on a 6.8-acre campus in the heart of South Dublin, is exclusively designed to serve as a home to the entire community and a meeting ground of cooperative effort. Inside, the 1,050-seat state-of-the-art auditorium is fully equipped to host any number of local events: from charity events, concerts, literary nights and neighbourhood gatherings; to education seminars, conferences and civic functions. The centre’s sports pitch is equally well equipped and can accommodate Gaelic football, hurling, rugby and football. In fact, the facilities, including meetings rooms and a full service café, are available for use by community and charity organisations including local clubs, schools and youth organisations. Emphasizing the opportunities created by the transformation of an abandoned site into a revitalized centre for the community, local and city dignitaries honoured the fellowship and spirit of the occasion. They included: Ms. Nicola Keating, Tallaght Anti-Drug Activist; Ms. Amina Moustafa Keogh, Sports Against Racism Programme Director; and Mr. Philip Cummings, Award-Winning Poet and Translator. The new Church and Community Centre is open to all visitors and provides an introduction to Dianetics and Scientology, beginning with the Public Information Centre. Its displays, containing more than 500 films, present the beliefs and practices of the Scientology religion and the life and legacy of Founder L. Ron Hubbard. The Information Centre also includes exhibits on the many Scientology-sponsored humanitarian initiatives and community outreach programmes, including: a global network of literacy and learning centres; a worldwide drug education, prevention and rehabilitation programme; a far-reaching human rights initiative; and the Scientology Volunteer Minister programme. In addition to congregational services, weddings and other religious ceremonies, the Chapel can also be used by charities and community groups for a wide range of gatherings, such as conferences and workshops. The facility further includes multiple seminar rooms and classrooms, and an entire wing dedicated to Scientology auditing (spiritual counselling). The opening of the new Church and Community Centre comes during a period of rapid expansion for the religion with 60 new Churches of Scientology from Los Angeles to Tampa, London to Milan, Johannesburg to Tokyo and Tel Aviv to Kaohsiung. Over the past decade, those openings have driven worldwide expansion for the religion to a rate surpassing the previous 50 years combined. In 2017, openings of new Churches of Scientology have taken place in Auckland, New Zealand; the San Fernando Valley, California; Miami, Florida; and Copenhagen, Denmark.